I’ve been thinking about posting this recipe for veggie curry for months now and I always decided against it because, to be honest, it is actually a bit daggy. 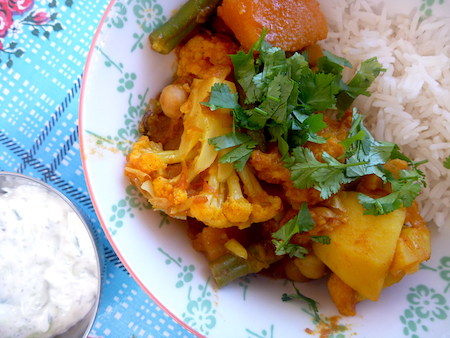 But then I thought, well, this blog is all about food I actually cook and eat and, at the right time and place, there’s nothing better than a good old fashioned veggie curry. I would probably never serve this curry to any of my Indian friends because it really doesn’t have that much relationship to real Indian food. It is what it is and, like all good nostalgically retro food, there is something very comforting about that. This particular recipe is adapted from Stephanie Alexander’s Cook’s Companion, where it is filed under ‘curried vegetables‘, which links it to those oldey-world Anglo-Australian curries that my mum used to make (she even used to make a version of curried sausages which is something I really don’t want to revisit). This is a great dish to make when the cupboard is bare with whatever vegetables you have in the fridge, but it is also good to make when you’re on holidays and you need to feed the hungry hordes. I often make this when I staying at my brother’s place in the country. I serve it with rice, some tzatziki, chutneys and a big green salad – it’s a very sustaining simple holiday feast. The secret to making a good veggie curry is timing the cooking of your vegetables – what you don’t want is undercooked potatoes and with a whole heap of overcooked mushy vegies. I like to cook the potatoes and carrots until almost tender and then add pumpkin and the softer veggies in stages. So make a big pot, throw some Neil Young on the stereo and kick back and enjoy! Cut potatoes, pumpkin, carrot, cauliflower and green beans into bite-size pieces. Heat oil in an enameled cast iron pan and saute onion until wilted, add curry leaves, ginger and garlic. Keep sauteing until onion begins to brown. Add mustard seeds, cinnamon stick, tumeric, chilli flakes and fry for a few seconds, then add curry paste and fry until fragrant. Add tomatoes and saute until they meld with spices, then add water or stock and simmer gently for five to ten minutes until the curry sauce begins to meld. Add potatoes, carrots and chickpeas and simmer gently until potatoes are almost tender (about 10 minutes) then add butternut pumpkin and cook for another five minutes until almost tender, before adding softer vegetables like cauliflower and beans. Simmer until all vegetables are almost tender, season with salt, then simmer uncovered for about 10 minutes until sauce thickens. Serve with rice, chutney, pickles and yoghurt. Yum! I love the idea of adding cauliflower to curry dishes 🙂 nothing better than vegetarian curry and I think I would add some frozen peas to this! 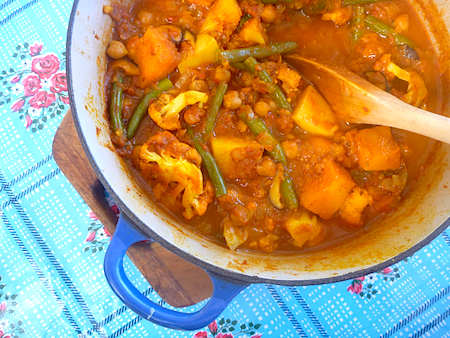 This is curry can be made up of whatever you have in your fridge, it’s completely adaptable to the seasons. This looks delicious! Love a good chickpea curry. I don’t care how daggy it might be, I love a good veggie curry. 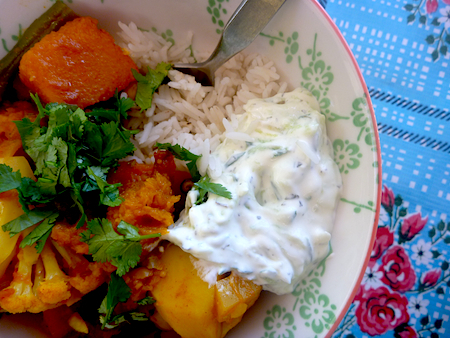 In fact, I had a pumpkin and chickpea curry last night! So warming in this cold Melbourne winter! I used to live in Melbourne and I feel quite nostalgic for their winters, but yes a good veggie curry really does warm you up like nothing else. Totally agree with what you said about the timing of cooking your vegetables. I usually but the Potatoes in first and then everything else goes in step by step.